One of my clients referred to a little box in her office as a ‘router’, but actually it was a Wifi access point and so a conversation about what is what ensued. Link many devices together so they can all communicate. This can be computers, workstations, printers, scanners, copiers – any device that interacts within a single IT system. Provide wireless access so phones, notebooks, laptops and tablets can be connected to the internet. Routers also have some clever little facilities. They can be set to prioritise certain traffic so if you are using the internet for phone, email, web browsing, video conferencing etc. you can choose what takes precedence. This means that if there is heavy traffic on the phone system it doesn’t kill your video conference, for example. 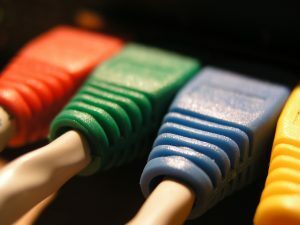 Routers can also be set up to block certain websites or keywords. So, for instance, you could stop your staff logging into their Facebook accounts during working hours! A router can also keep out unauthorised intruders acting as a firewall so if someone is trying to access your server via the internet the router will say ‘NO’! Every router is not the same and they vary in capacity so, if you are planning to install a new one you do need to discuss with your IT supplier exactly what you want to be able to do. Otherwise you could find that everyone’s email crashes every time the phone rings!